Tim Cook D11: Apple CEO thinks smart watch more natural than Google Glass. 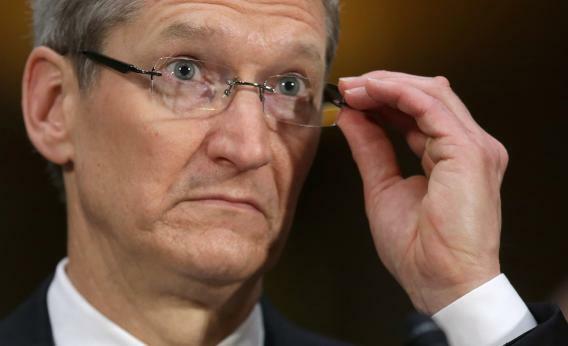 Tim Cook, seen here fiddling with his glasses, thinks most people would prefer to avoid fiddling with their glasses. One of those companies, Google, has already unveiled its smart glasses. But those don’t do it for Cook. That’s about as close as Cook came to saying anything specific about the “several more game-changers” that Apple has in the pipeline. Still, it’s about as strong a confirmation as you could hope for that Apple is indeed working on a smart watch. No doubt people are more accustomed to looking down at their wrist than up at their glasses frames for information—or at least, they used to be. But it’s hard to see how one is any more “natural” than the other, or how either one is more natural than pulling a phone out of your pocket. The interesting question here is not whether people feel more comfortable wearing things on their face or on their wrist. Clearly people have been doing both for many decades. What will really determine the success or failure of these devices is what they do. Glasses present a unique opportunity to shoot first-person photos and video, and potentially to pull up information about whatever you’re looking at, be it a person, a sporting event, or a historic building. Watches are ideally suited for biometrics, and might be better for discreetly checking a text message. Isn’t it possible that in five years, rather than debating the merits of watches vs. glasses, a lot of techies will be sporting both?